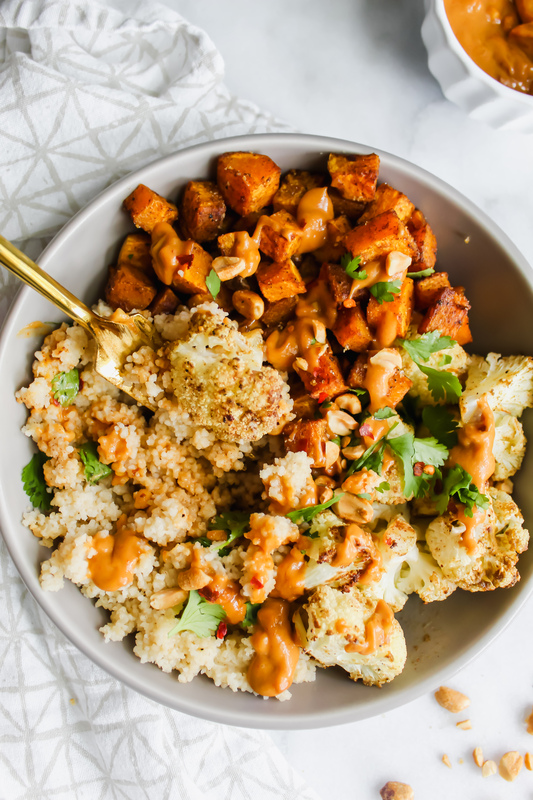 This Thai Peanut Butternut Squash Bowl is loaded with Thai spiced butternut squash, cauliflower and buttery couscous! All topped with a spicy sriracha peanut sauce! It’s the perfect, comforting Fall meal. Guys, I’m already so deep into Fall and we are barely a week in. 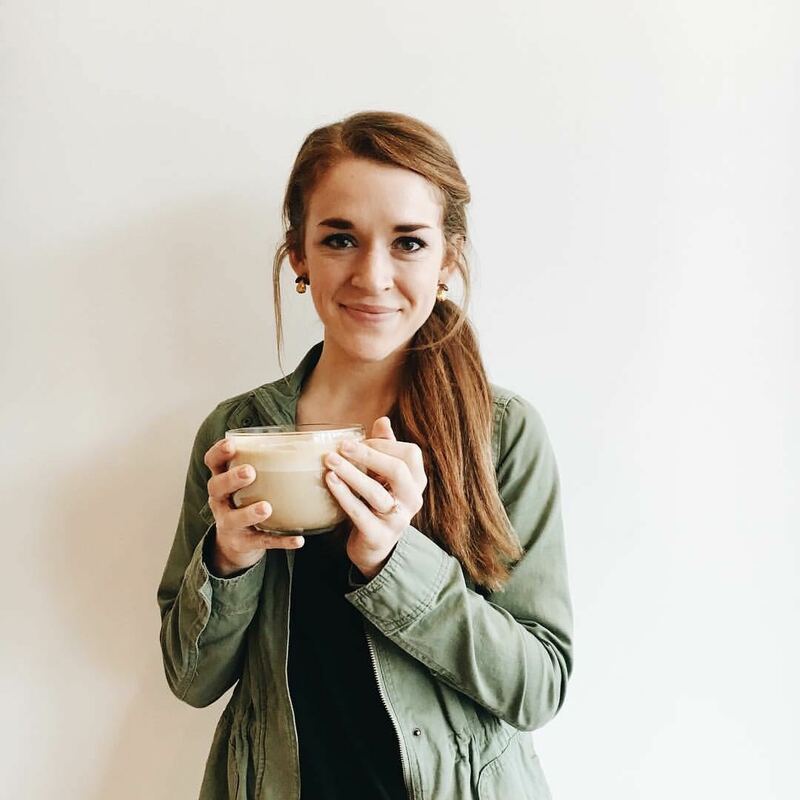 I’ve been eating my Cheesy Cauliflower Soup on the reg, eating my Healthier Pumpkin Chocolate Chip Muffins every morning for breakfast and burning Fall candles 24/7. This is all, mind you, while the high is still in the 80s where I live in North Carolina. Sigh. In fact, Ben and I even have made an Autumn Bucket List for the Fall season! And we have already crossed off two things. The first: watch You’ve Got Mail. Basically the quintessential 90’s Fall movie all about romance and emails and Meg Ryan’s amazing outfits. That movie gets me in the feels every time. We usually eat Chinese food while we watch it – but this time, I wanted to try something a bit more interesting. And thus, these Thai Peanut Butternut Squash Bowls were bowl! Thank you, T. Hanks and Meg Ryan for the inspo. Move over sweet potatoes! It’s squash season. Specifically, butternut squash. AKA the love of my life. Butternut squash is truly one of the most underrated parts of the Fall season. It’s wonderfully flavorful, has a balance of slightly sweet but still savory and gets it somehow gets crispy on the outside but stays delightfully soft on the inside. 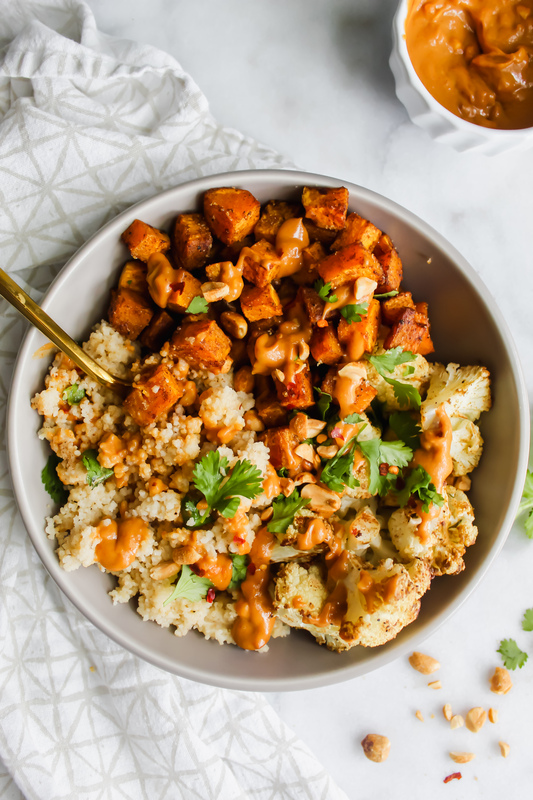 Butternut squash is the perfect vegetable to pair with cauliflower for this bowl. and then drizzled with this deliciously slightly spicy sriracha peanut sauce that I kind of want to bathe in. oh, and then you garnish with fresh cilantro and crushed peanuts for extra crunch. it’s so so so good. It’s insanely delicious. It’s sweet, smoky, buttery, spicy. There are so many flavors combined into this bowl. It’s so easy! 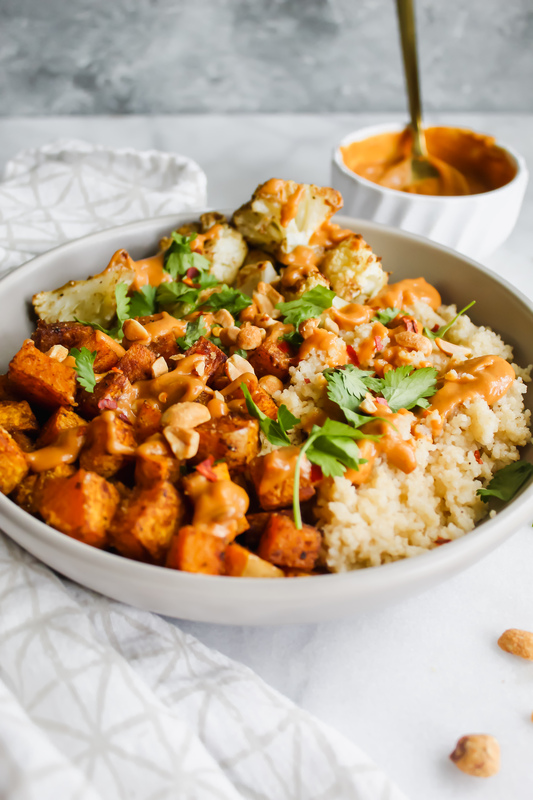 You literally just throw some veggies into the oven, cook the couscous which is the easiest grain to cook and then drizzle it with the sriracha peanut sauce. You can meal prep it! You can make a huge batch of the veggies, couscous and sauce at the beginning of the week and have it for lunch or dinner (or lunch and dinner because it’s that good) every single day! It feels like such a cozy, comforting meal to me but still remains healthy! It’s hard to find meals like this – healthy comfort food – but this one totally takes the cake! It’s different! This recipe made me step out of my comfort zone from the normal spices I use like garlic, chili powder, onion etc. The Thai spices that I use are so delicious and new to my palate and I think you will LOVE it! 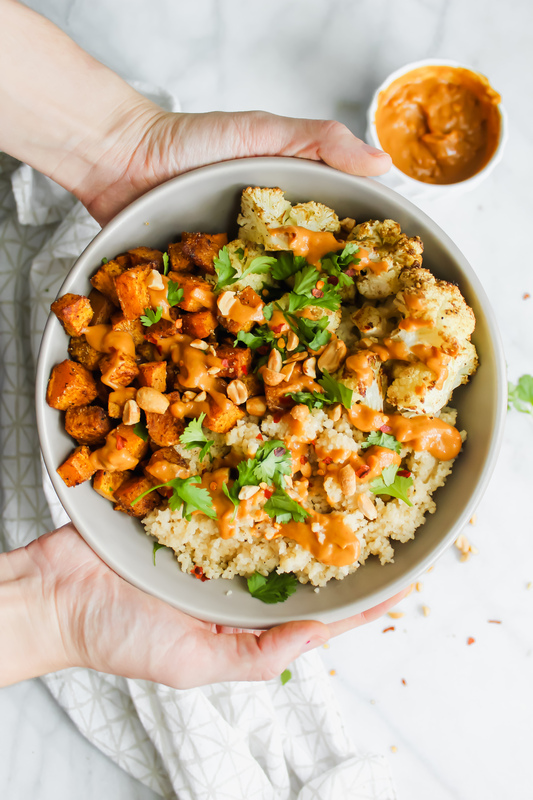 Not to mention, that Sriracha Peanut Sauce that I drizzled on top of this bowl: You should definitely just make a big batch of that every week to dip EVERYTHING IN. Seriously. Veggies, chips, a spoon….it’s that delicious. If you’re interested in more meals that you can prep at the beginning of the week, check out my Sheet Pan Sausage and Veggies or my 2 Ingredient Salsa Verde Chicken. Both extremely easy and extremely delicious! 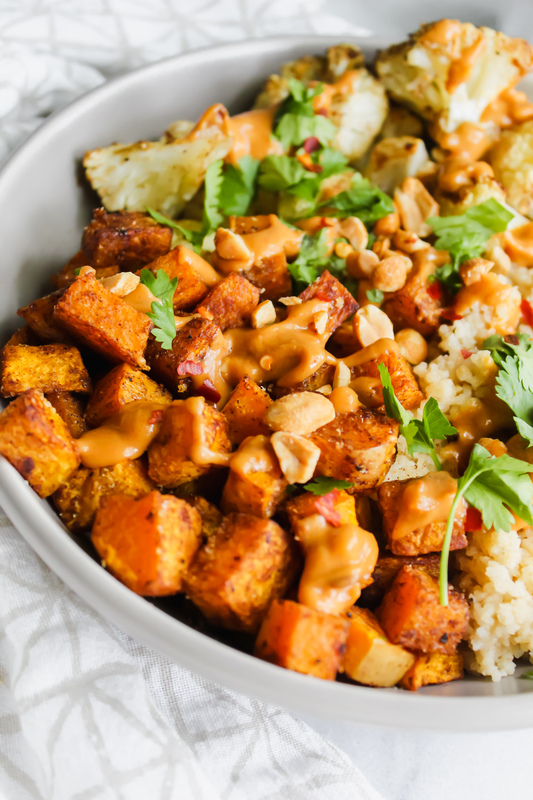 Hope you guys enjoy this extra comforting Thai Peanut Butternut Squash Bowl. Cheers to cozy Fall meals and cheesy 90’s romantic comedies! Preheat your oven to 400 degrees. Cut your butternut squash in half, take 1/2 of it and cut into small cubes. Cut your cauliflower into florets. Place into a large bowl and add the olive oil, cinnamon, five spice powder, cumin, cayenne and salt and pepper. Mix well. Spread onto a large baking sheet and roast for 25-30 minutes or until golden brown. Mix crunchy peanut butter, low sodium soy sauce, sriracha, garlic and ginger in a bowl together. Add a pinch of red pepper flakes. Use a splash of hot water as needed to thin out the sauce to drizzle it over the bowls. In a small pot, bring 1 cup of water, 2 tbsp of butter and a large pinch of salt to boil. Once boiling, add in 1 cup of couscous. Stir to combine. Take off the heat. Cover and let sit for 5 minutes or until easily fluffed with a fork. Thai Peanut Butternut Squash Bowl Assembly! Add your couscous to the bottom of your bowl. Pile on the butternut squash and cauliflower. 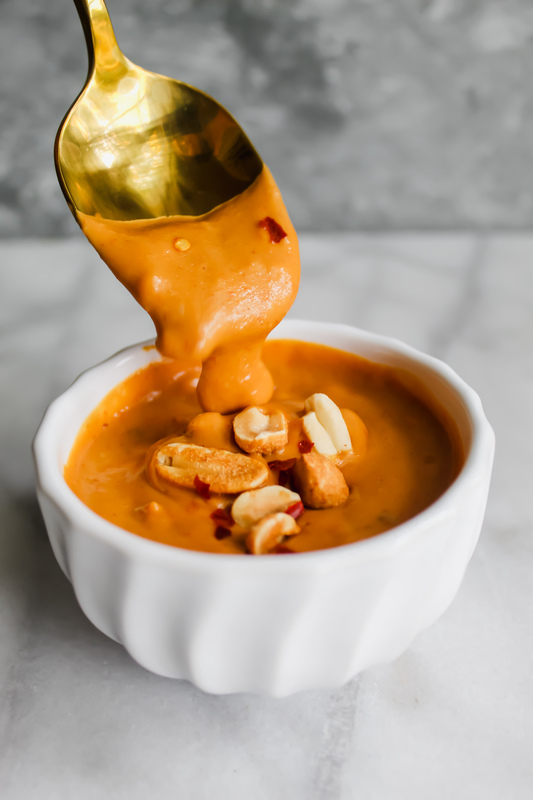 Drizzle with the sriracha peanut sauce and garnish with chopped peanuts, cilantro and red pepper flakes. Enjoy! I can’t wait to make this. My husband and I love Asian food. Yay! Hope you enjoy it, Chris! This looks like a perfect fall comfort food bowl. I especially love that Sriracha Peanut Sauce. Wooo! Thanks, James!! The sauce is killer!! Lol!! Yes! I feel the same way! Thanks, Dawn! You’re the best! Happy Monday! Yay! Thanks Laura. Hope you love it. This is so good! The sauce is spicy and bombbbbb. I didn’t have all the ingredients so I made a couple subs with the bowl overall (did quinoa, broccoli and chickpeas with cauliflower rice, over arugula), but I’m so glad I found this! Kept the squash and the sauce the same and will be using this combo again for sure! Mya! This makes me so very happy. The sauce is my favorite! Glad you enjoyed! Thank you so much for leaving a review!